acceptance. Their full-length debut CD appears ready to position the group among adult-oriented rock's elite. However, the story starts well before the November 14, 2000 release of "True North." For years prior to being signed to a major label deal, Fisher seemingly laid a path for certain stardom. They appeared on the Lilith Fair tour. The duo contributed to various soundtracks, including "Breakable," found here as well side-by-side with fellow Lilith alumna Tori Amos on 1998's "Great Expectations" soundtrack. They worked on the soundtrack for television's "Sweet Valley High." For months early this year they dominated MP3.com's most requested list--with their songs being downloaded more than 2 million times! Slowly, song by song, they built a fanbase clamoring for a full-scale piece of Fisher's work. Given their path to acceptance, it's a natural fit that Farmclub.com picked Fisher up. Through its web site and USA Channel television series of the same name, Farmclub.com allows unsigned bands to gain widespread exposure and, possibly, sign a record deal. 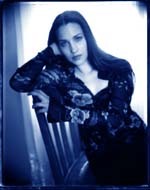 That was the case for Fisher, whose Farmclub.com/Interscope debut "True North" was pushed to stores early, fueled by the explosive regional popularity of their first single "I Will Love You." With plaintive, heartfelt lyrics and vocals by Fisher's namesake Kathy Fisher, "I Will Love You" was downloaded from the 'net by a San Diego, CA, radio station and played during afternoon drive time. Soon the station found itself flooded with requests for the track and information on the group. In addition, they've been met with critical success out of the chutes. "I'm a very open and honest person and I write about relationships," Kathy says. "But I didn't expect this to be such an incredibly emotional experience." Perhaps she should have. Though the duo is marked by emotive vocals and outstanding production, Fisher's calling card seems to be, unquestionably, in the strength of the writing. Every song paints a picture, tells a story, and speaks from the heart. Listeners can feel the emotion in every song, making the CD a truly spectacular journey. "True North" pulls reworked songs from Fisher's past, including their 9-track EP "One" and their soundtrack contributions. Each is rerecorded and accompanied by a selection of completely new tracks as well. Opening with "Hello It's Me," which treads musical territory reminiscent of Apple's "Criminal," and leading into the poignant, sparkling "Any Way" (which leans toward Alanis Morissette . . . before she was hated for over-exposure), "True North" is off to a brilliant start. The group maneuvers swiftly through "The Life," which berates ingrateful rock stars whose lives and careers Fisher would all-too-willingly assume, to "Simi California," a stripped down appraisal of a cheating relationship. Ultimately, Fisher proves to weave a collection of masterful, captivating and at times melancholy tunes. Fans of Lilith Fair compatriots such as McLachlan, Amos, and others will take an immediate liking to the group. Fans of ingenuity and creative marketing campaigns should check the disc out to simply show support. Fisher is a band to be commended for allowing their creative process to only begin with the recording of a superior album.